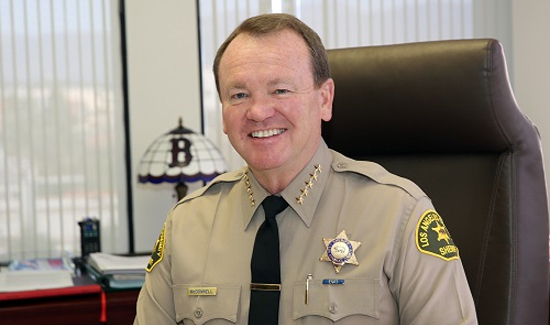 Los Angeles County Sheriff Jim McDonnell (pictured above) will ask the state Supreme Court to review a recent lower-court decision that barred him from giving prosecutors the names of deputies with histories of serious misconduct, he said in a statement Wednesday. The appeal, which has not yet been filed, will seek to “establish legal clarity” while balancing the privacy protections of officers’ personnel files, according to the statement. “Our intent was never to compromise or give away your rights. And at no time was the department seeking to voluntarily turn over information from anyone’s personnel file,” McDonnell said in a video issued internally to deputies on Wednesday. But Det. Ron Hernandez, president of the Assn. for Los Angeles Deputy Sheriffs, called McDonnell’s position “ill-advised” and said the recent court ruling provided proper guidance that allows for the department to give prosecutors information on a case-by-case basis pursuant to a court order. Several advocacy groups have called on the sheriff to appeal the decision, handed down two weeks ago by a Los Angeles appeals court. The court ruled that the names of deputies found by internal investigators to have lied, stolen, falsified reports and committed other types of misconduct are confidential and cannot be handed over to prosecutors — even in pending criminal cases in which the deputies are listed as potential witnesses. The decision was a victory for ALADS, the union that represents rank-and-file deputies, which sued the department last year over McDonnell’s attempt to give the district attorney’s office a list of about 300 deputies whose past misconduct could call into question their credibility as witnesses in court. The 1963 U.S. Supreme Court decision in Brady vs. Maryland obligates prosecutors to turn over any evidence favorable to defendants, which could include information that undermines an officer’s credibility.